Yesterday USD fell against EUR after Trump’s comment but today there are no major economic reports in Eurozone to support EUR. Traders will be focused on the reports from the US such as MBA mortgage applications followed by the US Federal Reserve’s August meeting minutes. 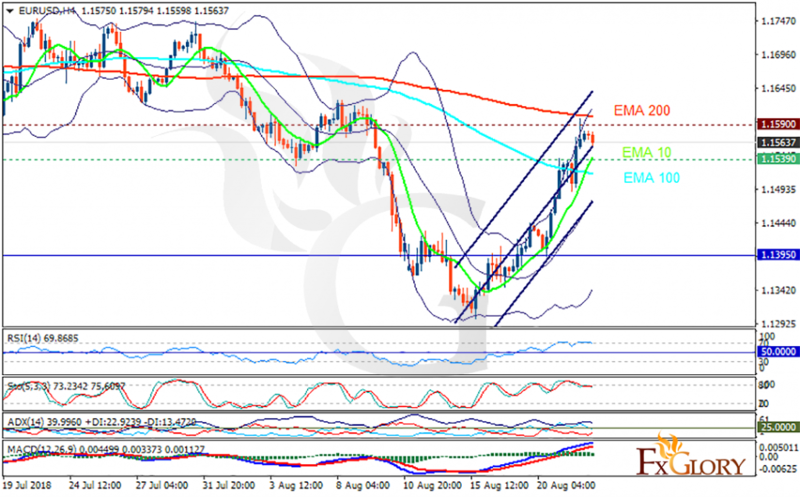 The support rests at 1.15390 with resistance at 1.15900 which both lines are above the weekly pivot point at 1.13950. The EMA of 10 is moving with bullish bias in the ascendant channel and it is above the EMA of 100 and below the EMA of 200. The RSI is moving in overbought area, the Stochastic is moving in high ranges and the MACD line is above the signal line in the positive territory. The ADX is showing buy signal. EURUSD may continue its bullish trend towards the upper Bollinger band at 1.16; then sellers can return to the market and target 1.14.